Get pizza by the slice or order whole pies. 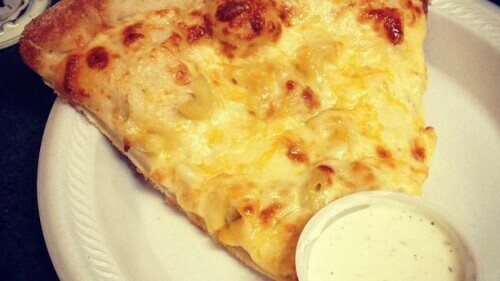 Buzzy's is the late-night go-to spot for a slice of their famous mac 'n' cheese pizza. Buzzy's also offers other specialty pizzas, as well as burgers gyros, and chicken wings. Open very late, vegetarian friendly, delivery available. I give Buzzy a ton of credit for putting up with students after bar close - he is always so patient. Great pizza! When I was in college this was a great place to have a slice of pizza after going out. Mac and cheese was awesome. :) Also, the owner of Buzzy's was always super nice and funny! Great late night food option! They have the BEST Mac & Cheese pizza!! Ordered a falafel here the other night. Was pretty excited about it after I asked the owner if they had harissa sauce and he said that they did. Harissa sauce is a very hot chili paste. I sat there waiting for about a half hour, the place was practically empty. Finally I get it and see the "harissa" sauce in a small container. I open it up, slather it on my falafel and take a big bite. Dear Buzzy's, marinara sauce with loads of chili flakes is NOT harissa sauce. It completely ruined the falafel. 2 stars because the mac n cheese pizza is quite good though. But I don't appreciate being overcharged for a sauce that I didn't ask for. I wouldn't go anywhere else for my late night post-bar pizza fix. And sometimes I stop even when I'm not out at the bar just because I'm craving some of their delicious pizza! I don't like Mac and Cheese in general so I always opt for the pepperoni. Sometimes I have to wait a few minutes for the pepperoni as the Mac and Cheese pizza is more popular and always available but it is well worth the wait to me. Their cheese curds are great too! The owner and his daughter are always very nice, even during the crazy drunken 2am pizza rush.